In an earlier posting (Documenting Your Memoirs with a Life Scrapbook) I introduced the concept of the life scrapbook, listed reasons to create one, provided example pages to give you an idea of the content, and gave some tips and steps to take in creating one for yourself. There are two components of life scrapbooking: the content and the presentation. The content refers to your life story and the memorabilia available to visually support your life story. The presentation refers to the look and feel of the scrapbook, the layout, and the way the life story is conveyed visually. Once you have performed the steps related to the content (discussed in the previous posting), you are ready to focus on the presentation. Wraps up this topic with some final thoughts on creating a life scrapbook. My hope is these two postings give you the enthusiasm and the path to create your own life scrapbook. Traditional scrapbooking refers to physically creating a scrapbook through traditional methods, including physically cutting, pasting, marking, and folding materials. This is a time-honored approach and has had a renaissance over the past two decades in the United States. Scrapbooking stores cater to people using this approach. Digital scrapbooking refers to an approach of imaging all memorabilia through digital photos and scanning and then laying out the pages on the computer digitally. This is a relatively new approach brought about by technological advances and affordability of digital cameras, scanners, and software. There are advantages and constraints associated with both of these approaches. The tools to assist in the creation process are easy to learn. The size of the memorabilia, like a diploma or ribbon award, may constrain how you can layout a page. It is easy to make copies of the scrapbook. This approach requires a computer as well as some computer and technical savvy to use software and the other electronic tools. Only you can decide which approach is right for you. There is no right or wrong answer. I decided to create my scrapbook digitally. I am comfortable with technology. I wanted to keep my memorabilia and photos intact in case I needed them for something else. And going digital allowed me to print multiple copies of my life scrapbook and share them with others. 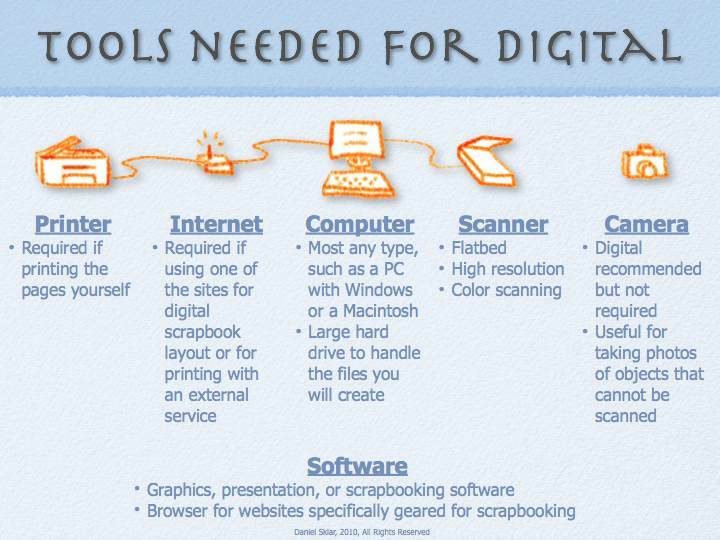 There are six tools typically used in digital scrapbooking. The computer is the central tool. It runs the software and interfaces with the other tools. You can use almost any type of computer and operating system, such as Windows or Mac OSX. Faster machines speed up the time to load in and manipulate images, but it is not critical to have an expensive machine. It is more important to have a large enough hard drive to store the files you will be creating. Images and the digital pages you will be creating can take up a lot of space. A scanner is the best tool to copy flat objects. You want a flatbed scanner and not a scanner that feeds in paper as it could damage the item you are scanning. Make sure the scanner can scan in a high resolution (the number of dots per square inch). The scanner should also be able to scan the image in color. High resolution and color allow you to have an image that looks very close to the original. A camera is used to take photos for the scrapbook. A digital camera is recommended as it is easy to transfer the image to the computer. If you have a film camera, the film can be developed at a store that gives you the images digitally (on a CD or stored on the internet) or you can scan in the print using the scanner. A camera can also be used to take photos of your memorabilia that cannot be scanned in, such as a non-flat object like a trophy. A printer is used to print a physical copy of the scrapbook. A personal printer is only required if you are printing the pages of the scrapbook yourself. You can also have the scrapbook printed on a professional printer with binding. An internet connection is required if you are using one of the websites to lay out your scrapbook or if you having the printing done by an external service. You can also use the internet connection to get ideas for your scrapbook and to download images and decorative items for your scrapbook. Software refers to the programs used on your computer to design and create your scrapbook. The software can be a graphics program, presentation software, or scrapbooking software. You may also need a web browser if you want to use websites specifically geared for scrapbooking or creating photo books. For your flat memorabilia, scan all of your documents and physical photos. Remember to use a color, flatbed scanner and scan at a high resolution (300 dots per inch). You can also scan thin objects on a flatbed scanner, such as buttons. For you other memorabilia that cannot be scanned, photograph these objects that you want in your scrapbook. You can make the photos of the objects less “flat” by performing some software manipulation. See the example below of an origami flower. This origami flower was photographed with a solid, distinct color behind it. Then an “alpha” tool in a software program was used to remove the background. Shadows were also added to give it a more 3D look. Select the background “paper” you want to use for your scrapbook paper. You can scan in the background or you can use digital background “paper” available from scrapbooking e-kits. You can use the same background throughout the scrapbook or you can use several backgrounds. For text, you can scan in your own handwriting for captions and notes. You can also use a font that gives the intended feeling for the scrapbook. In the example above, Handwriting - Dakota is an electronic font. "I love you" is real handwriting. 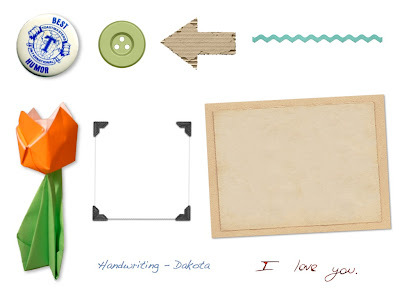 Decorations (embellishments) are very popular in modern scrapbooking. Scan in decorative items or gather electronic embellishments from clipart or scrapbooking e-kits. There are several software options. 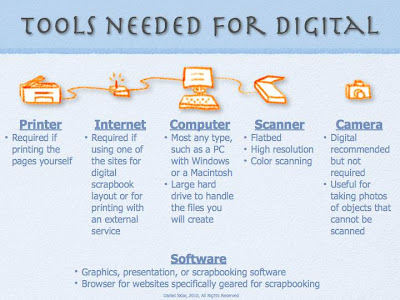 The table below lists different categories of software that may be used to create a digital scrapbook, along with examples of software programs for each category. Each software program has its own advantages and disadvantages. You can select based on what functionality you need, what computer the software runs on, how much you are willing to spend, what software you already have, and what software you feel most comfortable using. I used a combination of software programs. I used Photoshop Elements to scan in and crop images. I used Keynote to create and layout the individual pages. And I used iPhoto and MyPublisher to externally publish copies of the scrapbook. The techniques to designing a page digitally are similar to designing a page for traditional scrapbooking. Look at the memorabilia you have. Organize them on the page or pages. Add titles, captions, and other text. Add decorative items. And complete the layout. If you will be printing on the front and back of a page, remember that odd number pages are on the right side of an open-faced book. In addition, consider the page content and design based on facing pages. Apply picture frames or mats for photos. Consider creating additional pages to round out your scrapbook. You may want to have a preface or introduction, a table of contents, a conclusion/wrap-up/post-script, and front and back covers. As you create the pages, you will be saving the pages in the native format of the software program. These files should be kept so you can edit the page in the software program if changes need to be made in the future. Once you have completed all of the pages or your life scrapbook digitally, you may need to save the pages in another file format to load into another software program for printing. For example, iPhoto and MyPublisher can be used to create and print photo books. If you save each scrapbook page as one image, you can import each image as a single “photo” where the photo takes the entire photo book page and bleeds to the edge (no borders). Typical image formats are TIFF (high resolution, large file sizes), PNG, and JPG. Make sure the resolution is high enough for the page desired. Do a test print of a page early on before you get far in to the scanning, design, and build process. Otherwise, if the image scans are not high enough resolution, you may have to rescan all the items again. Include the background graphics in the resolution test. Before you print, proofread each page and correct any errors or omissions. And then proofread it one more time (or two). It is helpful to enlist a second pair of eyes; there will always be something you missed. Using a photobook printing service, such as Apple, Kodakgallery, MyPublisher, or Snapfish. Your life scrapbook will evolve as you go through the journey of creating it. It takes time to create a life scrapbook. Enjoy the experience and the journey. Do not give up. Take the opportunity during the journey to learn about yourself. And be creative throughout the process. Have fun. Looks like it could be a very meaningful and a fun way to record down one's life journal,memories...Thanks for the detailed and well organized instructions. I just discovered your website/blog and really enjoyed it. Re: your electronic Scrapbook tips: I made a scrapbook of pictures taken at a small family reunion and shared it with everyone. I had thought I'd make one by hand with all the little special things added, but realized I wanted to share it with the three brothers (oldest of the group), and then realized everyone would want one -- there was no way I could make that many scrapbooks by hand. As you mentioned in your blog, it was a lot easier to make changes, additions, and copies with it all being done digitally. Everyone was delighted with the unexpected memento.